For the horse to perform at his optimum level it is your responsibility as an owner to make sure of his comfort. The following is a very basic guide in simple terms that most anyone can understand to insure that the saddle that is placed on a horse will fit reasonably well. Do you have a saddle fitting problem? twitching its tail back and forth under saddle? doing its best to nip you during saddling? trying to lower its head while being ridden? trying to run out from under the saddle while you are mounting? developing white hairs under the saddle area? showing uneven sweat patterns or ruffled hairs on the horses back after being ridden? If you answer yes to any of these questions, then the very first thing you should check is saddle fit. Saddle fitting can be a nightmare for several reasons. One of the most frustrating aspects is that many times saddles that appear to fit while the horse is standing still proves to be ill-fitting when the horse in motion. It becomes even more frustrating because the saddle leather itself is covering what you need to see. Most standard Western saddles have 6 parts that are assembled and made into one tree. The bars and the angle at which they are assembled are the most important part of the tree. You can have a gaited horse and a foundation bred Quarter Horse standing side by side with both having a 7-inch gullet. Typically the gaited horse will require a 12-inch spread in the shoulder area of the bar while the Quarter Horse will require 13. If you put a saddle made for the Quarter Horse on the gaited horse it will fit at the top (or in this case gullet) but there will be no support at the shoulder. With the added weight of the rider the saddle will pinch at the top of the wither (or gullet) because there is no support at the bottom where the shoulder is. So in reality, gaited horses do not need a wider gullet like most people assume. Rather they need a narrower shoulder on proper bar angles so that all of the rider’s weight is distributed equally. A mutton-withered horse has less surface area for the bars to rest on. Therefore there is less surface area to equally divide the weight of the rider throughout the tree. Upon your inspection it will actually feel snugger in the front of the bars than compared to a horse with adequate wither. Be sure to check that the saddle is level on the horse and that it follows the shoulder angle closely. The rider’s weight is carried mostly on the ribcage of the horse’s back and the bars of the tree must match that shape very closely. It is only when you reach your hand up and under those bars that you can feel how closely they come in contact with the horse. Rock is determined by the amount of bend in the tree; the more rock, or rocker, the more extreme bend is needed within the bars to insure good contact throughout the length of the tree. To make it simple, the rock, or rocker, must match the shape of your horses back at rest and in motion. The edges of the bar on a gaited horse tree do not just end on a blunt edge. Instead the edges gently taper away from the horse and front of the bars have a bit more bend on the front edges so that the muscle just ducks in and out of the tree without impeding the gait. There should be at least 1-inch clearance on a Western Saddle between the bottom of the swell and the horse’s wither and no more than 2 inches unless your horse is mutton withered. A mutton-withered horse naturally is going to have more clearance because there is less wither there. At no time should any part of a saddle come into contact with the spine of a horse. Some horses have a pronounced backbone or prominent spine. To check the horse’s spine, observe if is well hidden and protected in the meat of the muscle or if it is bony by running your hands along the spine. 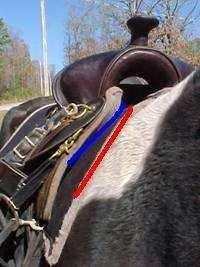 In any case care must be given to insure a proper channel down the gullet from front to rear of the saddle. A well designed gaited horse tree typically has 1-3 inches shorter bar than a traditional stock tree so that at no time is the tree interfering with the point of hip so as not to impede the gaiting action of the horse. Stock horses do not generally extend themselves as much as gaited horses. 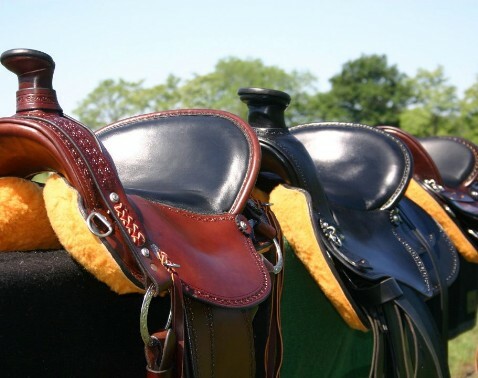 The rider's position in the saddle greatly influences how well a saddle fits. A rider in a saddle with too large of a seat cannot help but slide back and forth in the seat. Over time this will cause the saddle to move out of its proper position. 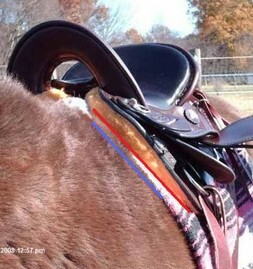 If the rider slides to far back, the saddle will lift up in front transferring all of the weight to the rear of the saddle, potentially causing pressure points. If the rider is pushed too far forward, all of the riders weight is transferred to the shoulders. The table below gives general guidance on the proper seat size. Waist Size 29 - 34"
Waist Size 31 - 40"
Waist Size up to 46"